There’s no need to tackle with expensive international shipping charges and delays on Amazon. 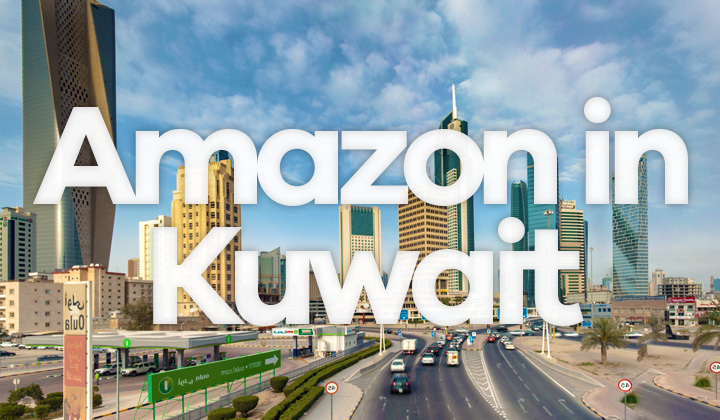 In April, 2019, Amazon has a local site version in Kuwait. Also Amazon is now in both in English & Arabic! Good news for those who want to use, and buy from Amazon in Kuwait, as there is no need to tackle with the USD currency, package forwarding charges, or poor international shipping availability on the US based Amazon.com website. The official Amazon website in Kuwait, is now known as Souq. They support fast & safe, nationwide shipping with low shipping charges, online shopping in Kuwaiti Dinar and cash on delivery to name some advantages. Headquartered in Dubai, Souq has become a known brand and the largest site for e-commerce among Arabic countries. Owned and run by Amazon, it’s also now officially the most popular online shopping website in Kuwait. Acquired by Amazon in 2017, the online store has it’s founding roots as far back as 2005 when a Syrian businessman, Ronaldo Mechor founded the site. It works in a similar fashion to the main Amazon site, which includes a seller portal where other businesses are also selling their products. Save! The Kuwait Souq has a “deals of the day” page, which has a variety of discounted offers for each day, some include free shipping — check it out! There are a few shipping options, mainly by courier services with delivery to your doorstep. Similar to Amazon, you can see the final price that includes cost of shipping after placing items to the shopping cart and proceeding to checkout. They deliver to all major Kuwaiti cities such as; Şabāḩ as Sālim, Janūb as Surrah, Ar Rābiyah, Al Farwānīyah, Al Faḩāḩīl, Bayān, Ar Rumaythīyah, Kuwait City, Al Finţās, Al Manqaf, Ar Riqqah, Al Jahrā’, Ḩawallī, As Sālimīyah, Salwá, Al Aḩmadī. Also all of the six governorates are supported for shipping, which consists of the Al Asimah, Hawalli, Farwaniya, Mubarak, Ahmadi & Jahra Governorate. Delivery services are available each day of the week, excluding Fridays. With the delivery time being during working hours, between 9:00 and 18:00. For cash on delivery, there will be an additional fee. While the Amazon in the USA only supports the English language, the Souq equivalent also has support for Arabic, although it does not speak Kuwaiti Arabic. You’ll see a flag of Kuwait at the top menu, which opens up the language settings tab after clicking on it. Select “Arabic”, or “English”. The interface is almost entirely bilingual, with titles, descriptions and the rest of the shopping interface offered in both languages. To directly access the English language site version click here. To buy from Amazon in Kuwait, you can browse through an extensive list of categories, which include smaller sub-categories similar to Amazon. Available main categories are; Health, Beauty, Eyewear, Pets, Wearable, Technology Devices, Home Appliances, Networking & Computers, Furniture & Home Decor, Electronics, Movies & Music, Books, Fitness & Sports, Baby & Infants, Home Supplies & Kitchen, Home Improvements & Tools, Tablets & Mobile Phones, Kitchen Appliances, Groceries, Cameras, Vehicle Parts, Collectables & Art, Game Consoles, Stamps & Paper money, Perfumes, Office Products, Clothing, Toys, Accessories & Jewelry, Outdoors & Garden, Bath & Bed, Furniture. The website has policies in place to tackle counterfeit or poor quality items, however you can safely shop among items sold directly by Souq. In any case, they guarantee your money back in 15 days if the ordered item is in it’s original packaging. Return shipping costs will be returned for items that are damaged, counterfeit or differ from that product description upon purchase. However, some items are marked as “non-returnable”, which includes categories like; Earrings, Underwear, Music & Software, Books, Socks, Lingerie, Swimwear, etc. And that’s the end of my online shopping guide..! There are some other, competing alternatives to Amazon in Kuwait, but the only official equivalent is Souq. Which is highly competitive in pricing & availability. Inquiries, comments or anything concerning Amazon in Kuwait? How to buy, shipping, deliveries, etc. all questions welcome. Thank you and please, share if possible. David. For transparency sake, I want to inform you my dear reader, that affiliate links could be present in the posts you are reading. This helps me work hard to write helpful content which is aimed for mutual benefit. Much gratitude!